Anthony Horowitz is a multi-talented author and screenwriter. He’s the creator and writer of the TV series Foyle’s War and has contributed scripts to Agatha Christie’s Poirot and Midsomer Murders. His mystery and suspense novels for adults are cleverly plotted, and he has a large following of young adult readers for his Alex Rider series and The Power of Five series. The novel begins when Diana Cowper walks into a funeral parlor to plan her own service. Little does she know how timely her visit will be, for a mere six hours later she is found dead – strangled – in her own home. Daniel Hawthorne, a strange and eccentric police investigator is given the case. Hawthorne is set on having his life and work documented as he goes about his investigations and he chooses Anthony Horowitz to act as his ghost writer! So here we have the “real” Horowitz as a character in his own book. At times the reader has to sort out if what Horowitz is alluding to is in this book’s plot or something in his real life, which makes for very interesting reading. At times amusing, this novel provides enough twists and turns and a simply brilliant ending to please even the most critical reader. This is Horowitz at his best. In the Acknowledgements, prior to the beginning of this book, Cleeves states that this is the last Shetland novel that she’ll write. For the reader, this means that she needs to wrap up the stories about Jimmy Perez and his team. This novel is all about dysfunctional relationships and families and I felt that the characters were simply shadows on the page – even Jimmy Perez wasn’t fully formed and we “know” him. When the body of a young nanny is found hanging in the barn of recent newcomers to the island, the gossip about her and the families involved, takes off like “wild fire”. Jimmy, along with his boss, Willow Reeves, has to sort out the truth from the lies and innuendo while dealing with their own fractured relationship. This is certainly a disappointing ending to a series that I’ve enjoyed reading through eight novels. Maybe it’s just as well that it’s the last installment. After the events in Stranglehold Ari Greene distances himself from his life as a cop and takes a job on a construction site for a new condo development in Toronto. His life has been changed dramatically with the discovery of a 21 year old daughter of whom he had no prior knowledge. When he stumbles across the body of Livingston Fox, condo developer, he is reluctantly thrust back into his former life, in pursuit of a vicious murderer who does not stop at killing only Fox. After an awkward reconciliation with Daniel Kennicott, his protégé, Greene and he join forces once again as they follow the money in the high-stakes world of downtown development in pursuit of Fox’s murderer. Like any case, once you crack the secrets you’ve pretty much cracked the case. In this case, some of those secrets strike very close to home for Greene. Rotenberg provides us with a first-class mystery as the suspects start adding up. It’s Greene who works it all out in the end – to a startling and unexpected conclusion. When Vera is asked to visit her local prison to give a talk on the repercussions of crime on its victims, she’s confronted by former DS John Brace, now an inmate for corruption and his role in a death. He wants to strike a deal with Vera. He’s prepared to provide her with information about the disappearance of Robbie Marshall, a notorious figure at the time he disappeared almost twenty years ago. In return, he wants Vera to look out for his daughter and grandchildren. Vera’s investigation into this cold case plunges her back in time to her years living with her father, Hector, and brings up disturbing memories of his illegal activities. Marshall was someone she remembers as having visited their house along with Brace and two others, all friends of Hector. The more Vera digs into this case, the closer it gets to home. With Hector being one of the last people to see Marshall alive, Vera is forced to consider the possibility that Hector was involved in Marshall’s death. As Vera reflects on this time in her life we’re given a better understanding of how her past and her years of living with Hector in such a dysfunctional household have formed the person she is today. Secrets and betrayal – so often the stuff of a good mystery. Cleeves’ first Vera Stanhope novel is steeped in both. When three women are brought together to work on an environmental study, they each come with their own share of secrets. And they each wear the cloak of betrayal. 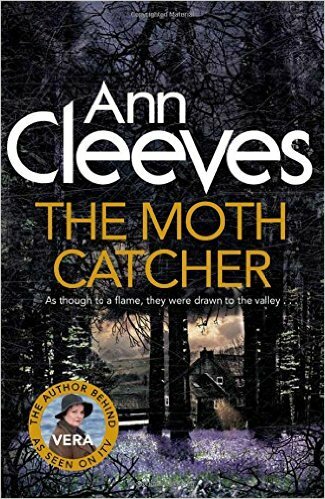 Cleeves fleshes out each character admirably and makes them come alive on the page. There’s Rachael whose confidence has been shattered by her lover and boss, Peter Kemp; Anne, who isn’t above playing a few unkind games, herself; and Grace, a timid-seeming woman whose past is a dominant presence in her life. When Rachael arrives at Baikie’s Cottage, the project site, she discovers the body of her friend, Bella Furness. Bella has hanged herself and Rachael finds this impossible to believe. One could say that “the clock starts ticking” from this point as Rachael is determined to prove that Bella did not take her own life. When another death occurs, Detective Inspector Vera Stanhope makes her appearance and Rachael is forced to re-evaluate everything that’s happened. With her casual and seemingly innocuous comments and questions, Vera is able to form a comprehensive time-line of events that point to the only person who could possibly be responsible for what has happened. This is a cleverly crafted mystery where no comment or piece of information, however seemingly unimportant, should be dismissed. What a difference nine years makes! This is the interval between the publication of this book and Cleeves’ first Vera Stanhope novel. After reading this, the first Inspector Ramsay mystery, I’m glad to say that Cleeves certainly has improved as a writer. The Northumberland town of Heppleburn is peopled with unlikeable characters, beginning with the odious headmaster, Harold Medburn, who is found hanged wearing his academic gown. Ramsay is called in to investigate the case and with every new page we find him jumping to conclusions. The school caretaker and his daughter decide to investigate the murders and Ramsay encourages them to do so, something that no proper Inspector would ever do. Cardboard characters with no reasonable motivation, along with a poorly crafted plot make this a very disappointing read. Di Vera Stanhope “loves” a good murder. However, when two bodies are found, separated by distance, but connected by their fascination for moths, she’s more than puzzled. What linked these two people that someone would find the need to kill them? While she sends her detectives, Holly and Joe, off to do the routine background checks and questions, Vera focuses on the people in the quiet community of Valley Farm in Northumberland where the murders took place. For as much as the residents of Valley Farm portray themselves as friends and good neighbors, Vera sees this disparate group of people as sheltering secrets. And one of these people, because of his or her secret, has committed murder – twice. Cleeves has given us the smallest of clues along the way in this novel so the “reveal” was quite a surprise. I enjoy the rapport that Vera has with her detectives – mentoring them but not letting them get away with any guff. So when one or the other of them takes the initiative and puts themselves in danger, she’s like a mother doling out “tough love”. They couldn’t be any luckier having her as their DI and are slowly coming to this realization. The unrelenting rain in the Cotswold village of Weston St. Ambrose brings more than floods and destruction as Christmas approaches. What it does bring is a body – that of a young woman who worked at the local pub. 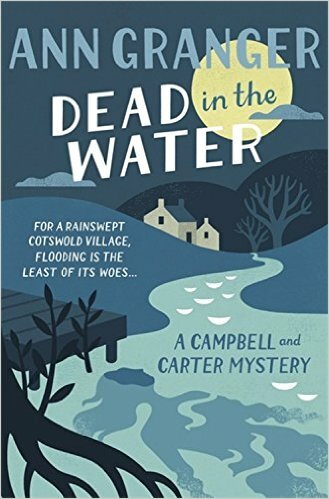 For Neil Stewart, the discovery of the body under his own mooring is even more disconcerting when he recognizes her as “Courtney”, the barmaid who served him and his fellow writers at their local Club dinner. Inspector Jess Campbell soon learns that Courtney was the daughter of the town villain, Teddy Higson, currently serving time at her Majesty’s pleasure. As her investigation proceeds, Jess is constantly pulled back to the Fishermans’ Rest, the pub where the Writers’ Club last met. She’s certain that something that happened at that dinner, with that group of writers, led to Courtney’s death. But the clock is ticking to find the killer before Teddy Higson is released on compassionate grounds and decides to solve his daughter’s murder himself. Granger takes quite a different tone with this series in comparison to that of Mitchell and Markby, the one I’m most familiar with. Teddy Higson and the members of the writer’s group are more like “caricatures” and don’t come across as completely believable to me. This was a “cozy” read but I’m not chomping at the bit for the next installment in this series.